About the same things my bullet aimed at. FREEDOM NYAMUBAYA rural development activist, dancer and writer, was born in Uzumba near Nyadire Mission in Mashonaland East Province in 1958.Cutting short her Secondary School education in 1975; she left to join the Zimbabwe Liberation army in Mozambique. While battling on the frontline she achieved the rank of FFOC (Female Field Operation Commander), later being elected Secretary for Education at the first Zanu women’s League Congress in 1979. She has also founded MOTSRUD, a local Marondera-based NGO that provides ago-services to rural farmers. Her love of the traditional mbira music has seen Freedom performing on platforms like a possessed spirit medium. To date Freedom has published 3 books: On the Road Again, published in 1986 by (ZPH) Zimbabwe Publishing House; Ndangariro, 1987 published by Zimpfep Zimbabwe Foundation for Education with Production; Dusk of Down, published by College Press 1995. 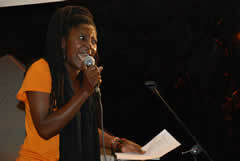 She continues to contribute to poetry anthologies and short stories in Writing Still and Women Resilience. Freedom sees writing as a continuation of the struggle for a peaceful and better world. Currently Nyamubaya is the Chairperson of Maninga Conservancy which natures and breeds wild animals such as buffaloes kudus Sables lions, leopards and many more plain game. // “Poetry is my friend something I can trust and depend on in good and bedtimes’, poetry occupies the space especially during lonesome times. In poetry and musical rhythms, spiritual healing repairs cracks and potholes to replenish lost energy and boost hope. // The first time I wrote a book I was 13 years and the story was about myself. I struggled to educate myself and wanted to share my story with others since I was the only child with such a problem at this school. “OF CAUSE IT NEVER GOT PUBLISHED.” I write because I like to communicate and associate with others. I enjoy writing because in the process of doing so I understand myself better. // In my first published poetry book “ON THE ROAD AGAIN” the poetry captures events issues and feelings during and immediately after the liberation war. The poetry attempts to inform and educate people on what happened during the war, fear of betrayal by leadership and emergency of a dictatorship by a small minority claiming custody of the country and the disappearance of freedoms and human rights, In the poem on page 13 “A Mysterious Marriage” in “ON THE ROAD AGAIN”, the prophesy on the lack of freedoms is true today than any other time in Zimbabwe. // In “DUSK OF DOWN” the book captures day to day lives of ordinary people, female and male freedom fighters. I attempt to describe real situations of groups and individuals at work from battle fields, prisons, to being raped by my own comrades. The book provides facts on specific experiences of the war encountered by ordinary people and freedom fighters which only come once in a life time. It also provides education on the history of Zimbabwe’s revolution from a participant’s point of view. // From my unpublished volume “IN THE ABSENCE OF VISION” the volume focuses on post independence time. I write about survival at the work place, dance hall, the streets and paths in towns and rural areas. It talks of the volcano that became the land repossession, revenge, hate, deterioration of morals looting and dictatorship. // Writing for me is the transformation from the use of guns and bombs to tools of genuine liberation, the pen, the mouth, the hands as a means to total freedom.